Old Ben the prospector finally strikes it rich when he stumbles across the lost Treasure Trove mine. But this also attracts the interest of a band of outlaws. The first of the original Planet of the Apes movie I saw was the last in that cycle, when I watched Battle for the Planet of the Apes in the theater. I was young enough to overlook or simply not recognize its faults and I still remember how much I enjoyed the setting and the action. I liked Roddy McDowell as Caesar and really enjoyed Lew Ayers' cameo as the super-cool Keeper of the Armory. I saw the rest of the films on TV at various times over the next few years ago. 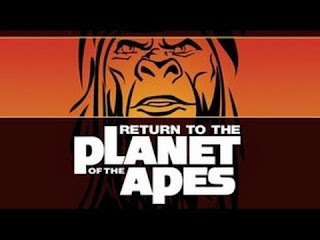 I have since been a fan of the original movie cycle and I'm really looking forward to watching the original POTA film on the big screen this July when it plays as part of TCM's classic movie revival series. I never did see either the Tim Burton remake or either of the films in the current reboot, so I can't pass judgement on them. But I do enjoy other POTA universes. In fact, there's one particular Apes universe that (if I might be permitted a blasphemy) I like a little better than the original film cycle. This was the Saturday morning cartoon Return to the Planet of the Apes, that aired on NBC in 1975. It only ran 13 episodes, but intelligent writing and a real concern for internal continuity made it a rich and entertaining show. Return has several important points in its favor. First, the design work overseen by Doug Wildey is excellent and imaginative, doing wonders to make up for the limited animation. 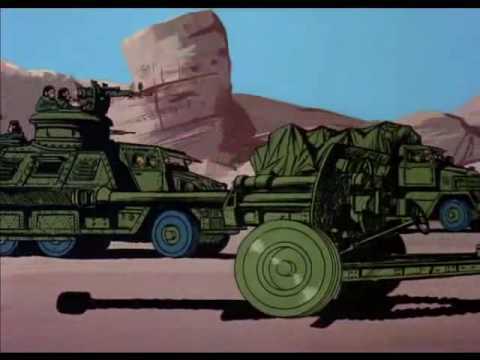 In fact, the show was designed to take advantage of the animation technique--many individual shots were still frames that looked like well-designed comic book panels. Details such as the design of Ape City and General Urko's military equipment all added to the visual appeal and the overall verisimilitude of the show. "When I first mapped out the show, I took the astronauts and kept them as separate as I could from the other humans for the first three or four episodes. And then I got them involved with other humans up to a point. So the original idea was that they were astronauts arriving on the planet of the apes, they're fugitives, and mainly they keep hiding to figure out what the [heck] they're going to do. I put the stories together from one to 13 in the sense that at the end of 13, the humans are almost as powerful as the apes. At the beginning, though, they're like mice running around hoping not to get trapped. That's the simplified philosophy behind it. My idea was that they would be animals at the beginning and slowly evolve into a crude civilized bunch of people from the standpoint that they might be more organised." It's this story arc and the writing in the individual episodes that really make this a great series. Three astronauts (Bill, Jeff and Judy) are trapped in a time vortex and land on Earth in the future. As is typical in pretty much an version of POTA, they don't initially realize that they are on Earth. At first, they are simply trying to survive, with Bill getting captured by the apes, befriending Cornelius and Zira and managing an escape. They team up with Nova and the other primitive humans. 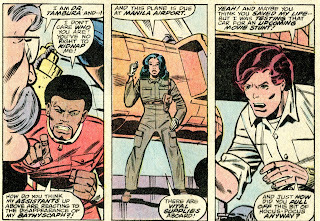 Judy is captured by the Underdwellers--psychic mutants based on those from Beneath the Planet of the Apes, but slightly less murderously fanatical. The series is grabbing elements from several sources. The ape civilization is keyed off the technologically advanced one from the original novel--though they have no idea about air travel (a plot point in later episodes). 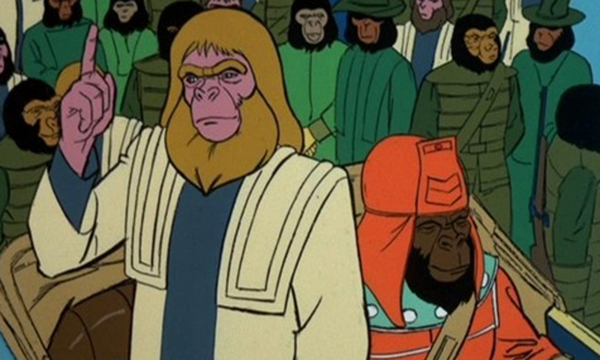 Various ape characters (Cornelius, Zira, Zaius, General Urko) are taken from the first two movies. Brent--the main human character from Beneath--shows up re-imagined as an astronaut from 150 years in the future of the original astronauts, but who arrived in the ape-dominated world years before them. I've already mentioned the Underdwellers as based on the mutants from Beneath. All these elements were mixed into something that is still POTA, but new in its own way. Then it is anchored onto an overarching story arc that runs through the entire series. 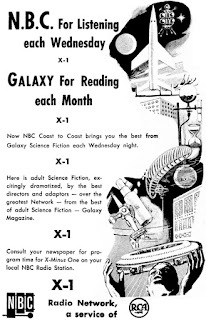 Plot elements are never forgotten and pop up in the story at logical moments--a laser drill recovered from the wrecked space ship; a particular mutant monster that makes a return visit in a later episode; a restored World War II airplane that Judy knows how to fly (which includes an episode dealing with the need to acquire more fuel for it). 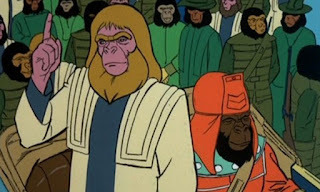 I particularly like Doctor Zaius in this version of POTA. Actually, we always kind of like him, don't we? In the original films, he can be cruel, self-righteous and dishonest, but Maurice Evans' performance always reminds us that he's desperately trying to keep his own civilization from destruction. In the cartoon, his negative traits are downplayed. He still sees humans as a threat and is terrified at the thought of intelligent humans, but he's portrayed as much more honestly straightforward. The voice work has sometimes been criticized as too unemotional. I think this is valid. In fact, Cornelius and Zira occasionally sound like they've been popping quaaludes. But Henry Corden really goes to town as the power-mad General Urko, voicing him in an appropriately over-the-top manner as Urko descends farther into paranoia over the course of the series. The last episode in a cliffhanger of sorts, with Bill and Cornelius acquiring proof that humans once ruled the Earth and hatching a plan to approach the Ape City rulers with this. Sadly, the show was cancelled, so a second season dealing with this never materialized. All the same, the various other elements of the story arc are wrapped up well enough to give keep a viewer satisfied. I actually had an idea for a plot element that I think would have added a lot of emotion to the series. Throughout the 13 episodes, various characters are in danger, but there are never any actual fatalities. This was because it was a children's show. Explosives and artillery are occasionally used, but I don't think a single round of small arms fire is capped off at any time. pay enough attention to this. But I simply disagree with some of the decisions made regarding violence on Saturday mornings during the 1970s. Violence is an essential part of storytelling and a level of violence in a children's story (including deadly violence) is appropriate. A discussion of where the line should be drawn would be a fascinating one to have, though in the end this is a decision that parents should make for their own children. But I think Return to the Planet of the Apes. as good as it was, would have been even more effective if it had allowed a few deaths. 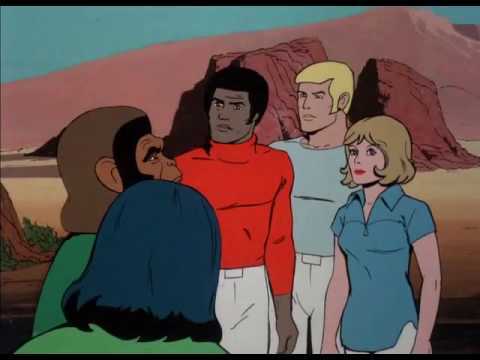 For instance, there's an episode in which the astronauts lead the primitive humans on a dangerous journey to find a safe haven where the apes can't get to them. Losing a few of the humans to the various threats along the way would have been an effective way of adding tension and opened discussions as to whether what they were doing was worth the cost. Also, lets say the astronauts got hold of a few rifles. Would they have been justified in using them in self-defense? What would this have done to their friendship (and very helpful alliance) with Cornelius and Zira--who are portrayed as peaceful and compassionate throughout the series? Would the two chimpanzees have been torn between continuing to protect the humans from genocide with loyalty to their own people? But none of that could be dealt with unless Bill or Jeff puts a bullet in a gorilla soldier. It is a show marketed towards children, so the discussion about how much violence should be in it is worthwhile. Though I think a few fatalities would have helped the show, someone else might legitimately think it was perfect just the way it was. Anyway, the series is available on Hulu, so if you are in the U.S., you can watch it there and decide for yourself. It's also on YouTube, as least at the moment I'm writing this--though I'm unsure of the copyright situation, so I don't know if the video I'm embedding below will remain active. 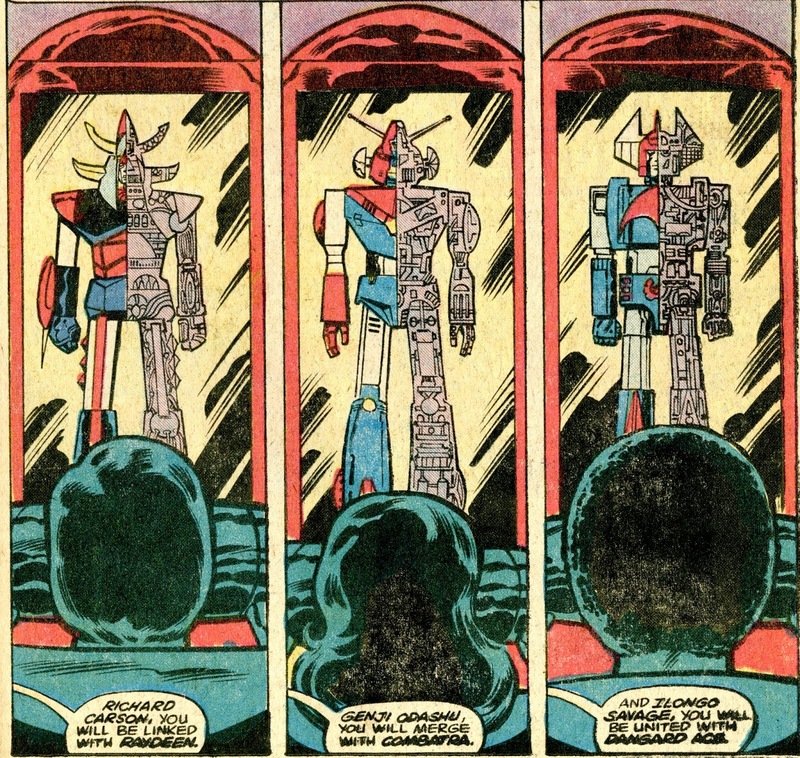 It's almost impossible to imagine a time when giant robots capable of transforming into various vehicles were NOT a part of our pop culture. 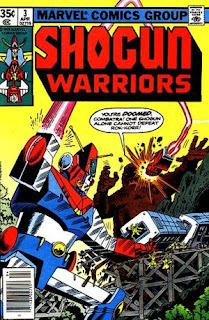 I'm not sure if the Shogun Warrior line were the first toys to go this route, but the Marvel comic book adaptation arrived a good half-decade before the Transformers or the Go-Bots popped up in cartoons and comics. 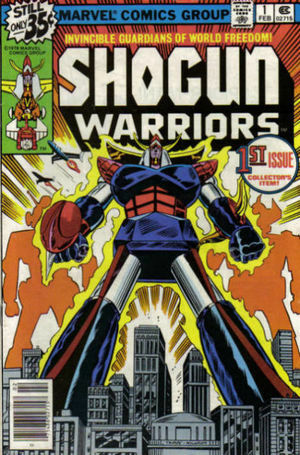 Until recently, I hadn't read Shogun Warriors. 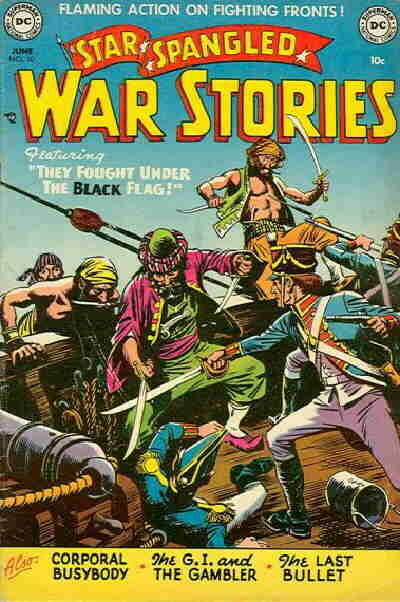 I was in the Philippines when it first came out and (though the Stars-and-Stripes book store in Subic Bay was well-stocked with comics) I don't remember seeing it. 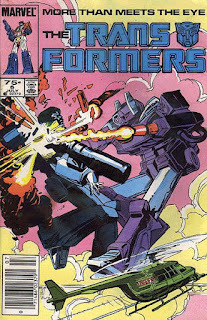 But I was able to recently score all 20 issues for less than 20 bucks on Ebay; I knew I'd like Herb Trimpe's art work; I generally like Doug Moench's writing; and Marvel did have a great record with later books based on toys in which they gave us strong characters and strong stories. So I've decided that, as I read these for the first time, I'll review them in 5-issue chunks. 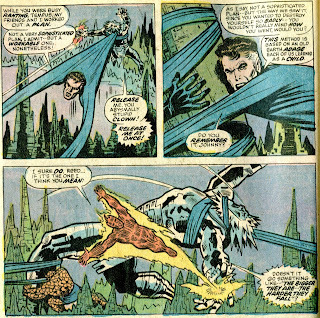 I'll also include a review of Fantastic Four #226, in which some closure is given to the characters after Marvel lost the license. I'm not going to post these reviews four weeks in a row, by the way. I'll space them about a month apart. I appreciate my small readership and--well, actually, I have no idea what sort of comic book reviews you all enjoy the most. So I'll keep up the variety. 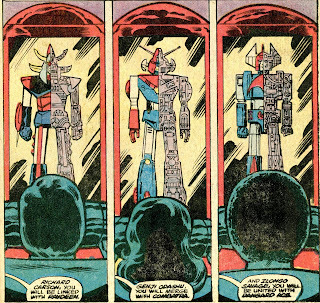 The first issue starts out with a bang, with the giant robot Raydeen--piloted by a trio of humans--defends an unnamed Japanese city against a cyborg monster. In Japan, they call this "Tuesday." After a few pages of fun action, we get an extended flashback to set up the situation and characters in more detail. One problem Doug Moench had was that there is a ton of exposition needed to give us background on the Shogun Warrior pilots, set up the overall plot, and give us details about the weapons and capabilities of the robots. Because of this, the early books are very dialogue-heavy and there's some minor pacing problems. But the plot is a fun one and the robots are simply magnificent. Shogun Warriors runs on pure Rule of Cool and works beautifully on that level. The series is a part of the mainstream Marvel Universe, though this isn't a factor early on. We learn that a secret organization of people descended from aliens--the "Followers of the Light"--have been guarding Earth against a chaotic evil organization currently led by a villain named Maur-Kon. The bad guys seem to be dedicated to destruction and death simply because they're evil. Just to get my last minor criticism out of the way--it would be nice if the bad guys had a more complex motivation. But perhaps that's built upon in later issues. The villains were defeated millennia ago, but now a volcanic eruption has woken them and they are using a combination of science and magic to unleash new monsters on the world. The Followers of the Light teleport three humans to their secret base--people selected in advance to pilot the robotic Shogun Warriors and fight the monsters. This is a major surprise for the humans--who didn't know they'd been selected for anything. But they soon accept the situation with remarkable aplomb. The first monster is defeated--or at least its outer bionic shell is. The Earth elemental on the inside escapes. That gives the good guys time to get better training and fire up two more robots. They're soon ready to go another round with the Earth elemental--who rather rudely counters this by dividing into three beings--Earth, Fire and Water. story rolling despite there still being too much dialogue. The current monsters are defeated. The head villain--Maur-Kon--has decided that the success of the robots means that his group should abandon magic completely and turn to pure science. One of his minions, Magar, disapproves of this--so soon there are back-stabbing shenanigans going on among the bad guys. 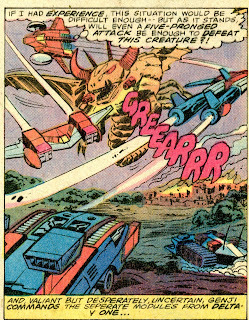 Maur-Kon orders a robot called Mecha-Monster built, which allows Trimpe to treat us to a really nifty splash page. Magar--the guy who disapproves of turn to pure science-- tries to destroy the robot, but only succeeds in creating a magic-science hybrid creature that goes on an uncontrolled rampage. 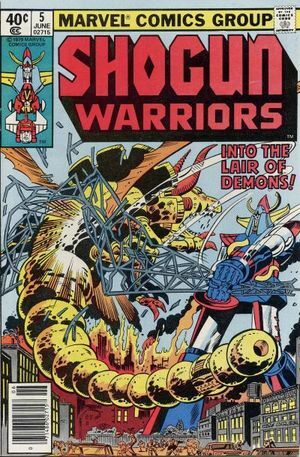 This leads to yet another great fight, with one of the Shogun Warriors--Combatra--getting to show off its ability to split into five separate vehicles. As the monster is sent running, Genji (the Japanese test pilot who pilots Combatra) decides to back track it to its source. 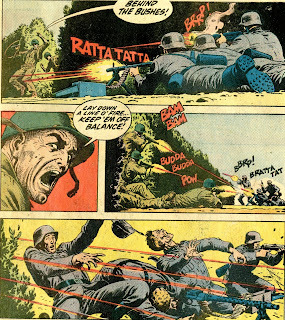 She locates the villains' base, but unwisely decides to press ahead on her own, flying into a tunnel in the vehicle formed from Combatra's head. Magar, who was about to lose his spot on Maur-Kon's Christmas Card list because he tried to destroy the Mecha-Monster, redeems himself by damaging Genji's vehicle. So the fifth issue ends with a rather intense cliffhanger--Genji is a prisoner and her Shogun Warrior robot is captured. 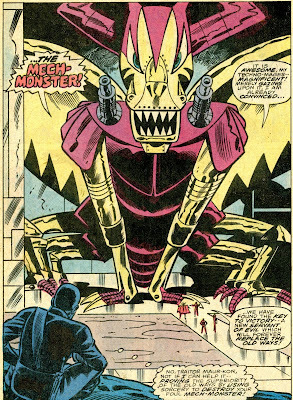 As I said, the series really does run on Rule of Cool, keying off Herb Trimpe's ability to give us kinetic, lively robots based on the original toys and creating some visually outstanding designs for the monsters. The criticisms I cite above are all valid, but none of them are serious enough to distract from the overall fun of the series. We'll cover the next five issues in three or four weeks. Meanwhile, for next week: He's a pig--his partner's a cat. Together, they solve crimes. Early issues of DC's Star Spangled War Stories featured covers highlighting stories about the then-current Korean War. By 1953, the focus had shifted to primarily World War II. 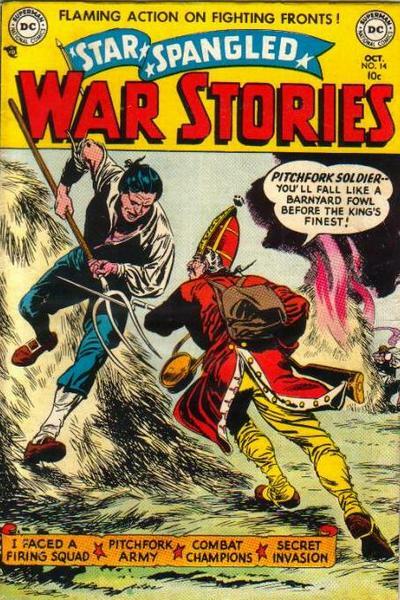 But every once in awhile, we'd get a pretty nifty cover portraying earlier wars. Holmes and Watson ring in the New Year with a desperate search to find a bomb hidden aboard an ocean liner. 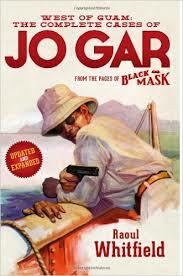 I think Raoul Whitfield's Jo Gar stories rank among the best stories in the hard-boiled genre. I think the 6-part "Rainbow Diamonds" story arc is the best of the Jo Gar series. 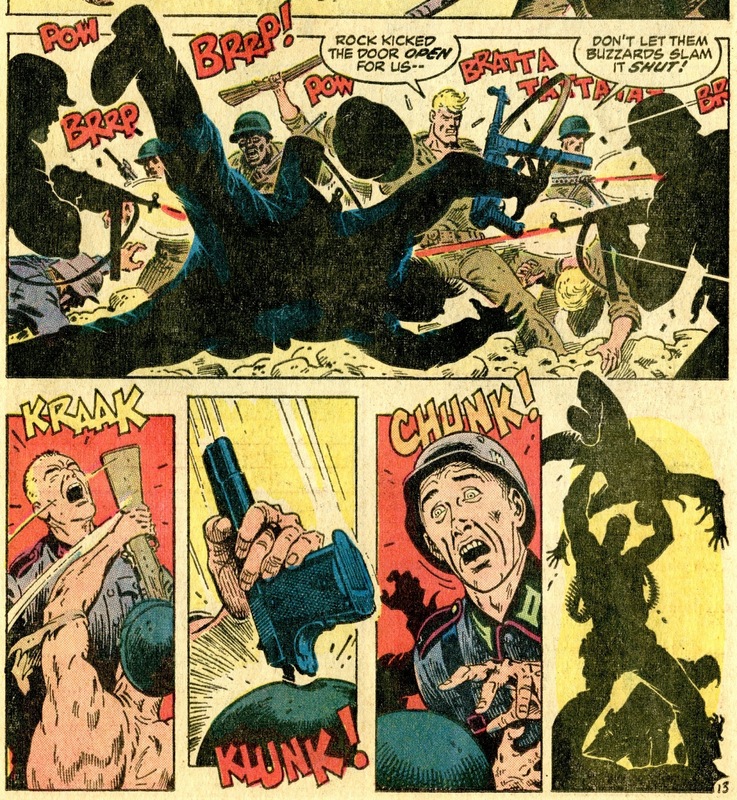 That being said, "Red Dawn" (published in the May 1931 issue of Black Mask) is arguably one of the weakest in the overall series. Perhaps it's because its in the middle of the "Rainbow Diamonds" arc, when many serials hit a bit of a lag. But whatever the reason, it is flawed in that it depends on several over-used cliches to move the story along. I'm not against cliches. When used cleverly and sparingly, they are an effective shorthand to provide both exposition and movement in the plot. But in "Red Dawn," I'm afraid they seem a little too obviously a contrivance. When the last story ended, Jo Gar was in Hawaii, having recovered one of the ten missing diamonds but having run out of living suspects. Good fortune comes in painful packages, though. One of the original crooks kidnaps Gar, convinced that he has all ten diamonds. That part I'm okay with--the villain is presented with a reasonable motive for thinking Gar has been lying about having the diamonds. He kidnaps Gar to beat the location of the diamonds out of him. But its here that Whitfield falls into cliche. First, the bad guy spouts off important information to Gar for no good reason at all--primarily that he has a female accomplice. Gar had no idea she existed before this and there was no reason to tell him. Second, the bad guy comes up with a nasty but overly complex method of killing Gar after he's done with the island detective. Whitfield, though, still saves the story. There is a high level of tension built into the plot and Gar's cleverness in manipulating the villain with lies and then coming up with a brutal but effective way of beating the assassination attempt makes for great reading. Whitfield is just that good--he might stumble a little this time in plot construction, but he makes up for it with honestly-manufactured suspense and hard-core characterizations. So the story ends with another dead bad guy, but with nine diamonds still missing. He knows a little more than he did before, though. He knows there's a double-crossin' dame out there somewhere. Find her and he finds the diamonds. 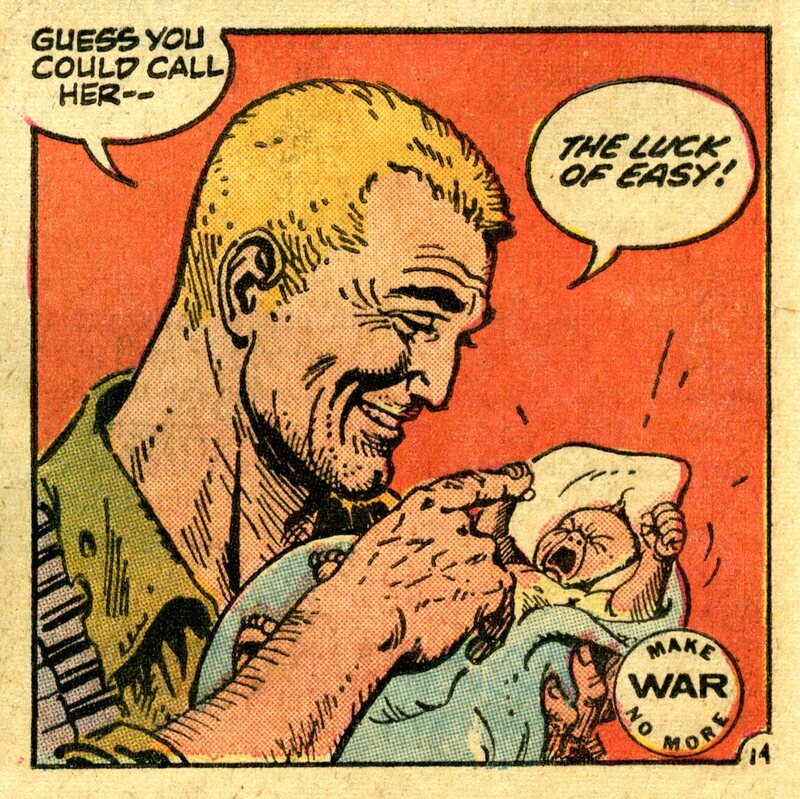 Let's Have a Baby--IN A WAR ZONE! I'll get the part that bugs me out of the way first. It's something that bugged me even when I first read this issue as a kid. 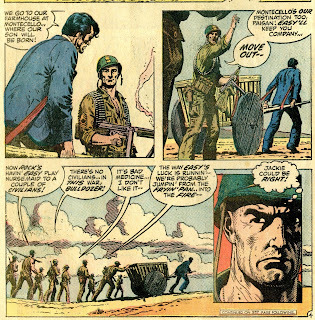 The plot (from Our Army at War #249--Sept. 1974) involves Rock and Easy Company traveling to a farm on a hilltop to defend it against an impending enemy attack. Along the way, they find a man pulling his very, very pregnant wife along in a wagon. They're heading to the same farm. It's their farm and they want to have their baby there. Now I get that a farmer can feel a deep connection to his land. That's fine and proper and a feeling we non-farmers should respect. I get that he wants his child to be born on his farm. That's also fine and proper and something we should respect. But his farm is currently in the middle of AN ACTIVE WAR ZONE! 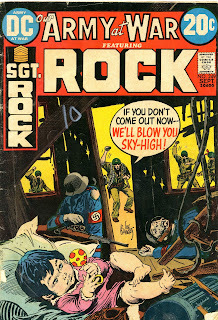 And all through the story, Rock asks them if they want to head for safety. Both the man and his wife consistently refuse. 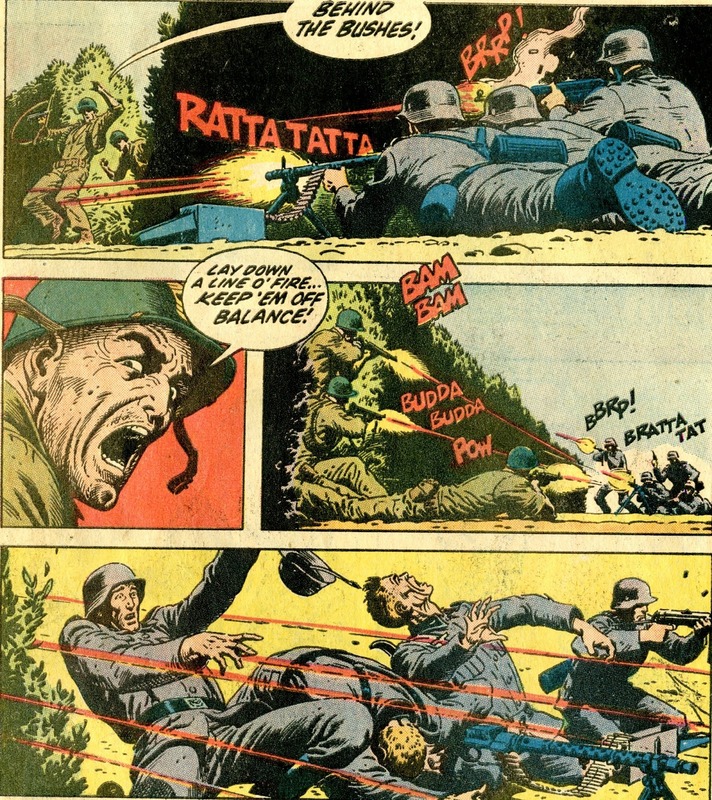 Rock then simply brings them along--and is even forced to detail his best sharpshooter to help deliver the baby at a key moment in the ensuing battle. Gee whiz, Rock. I get that you want to help the couple. And, to be fair, one of the themes in the story is that the hard-core soldiers of Easy still pause to help and protect the innocent. But the set-up is awkward. The husband isn't just being loyal to his heritage. He's being an idiot who is risking the lives of his wife and baby. Rock should have called him on this and FORCED him to turn back. But everyone simply accepts the guy's decision--even when they run into first a minefield and then an ambush on the way to the farm. The rest of the story, though, is excellent. 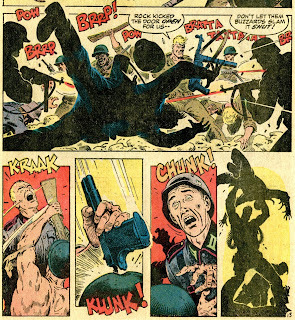 Russ Heath does his usual brilliant job of portraying the action, especially the battle for the farm, which unfolds a little more realistically (at least at first) than is usual in a DC war book. 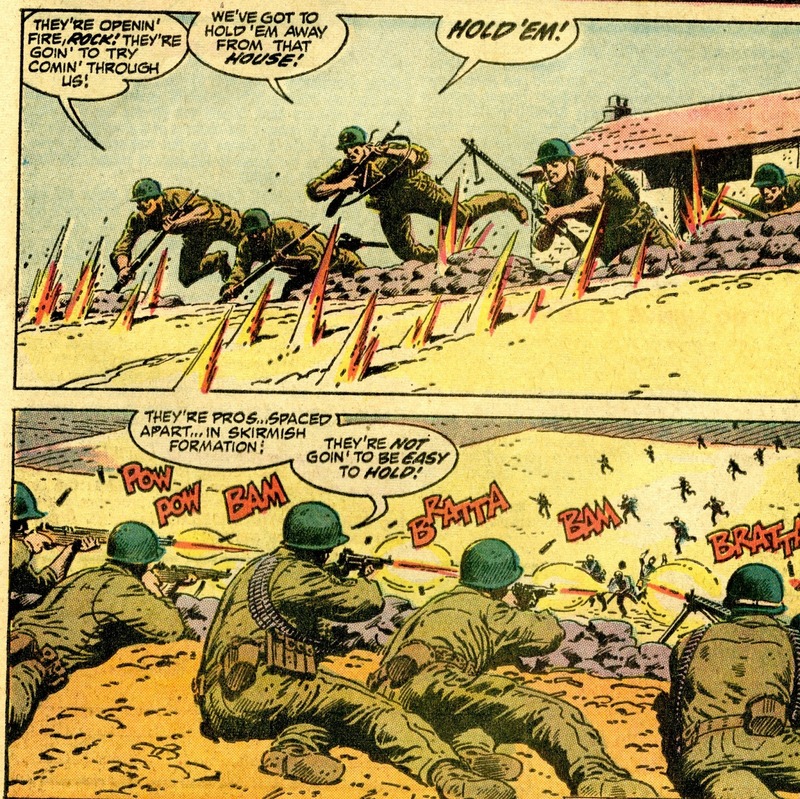 The final few panels of that battle, in which Easy Company counter-attacks and drives off the Germans, is stark, brutal and memorable. In the end, Easy holds the farm and the farmer has a daughter. 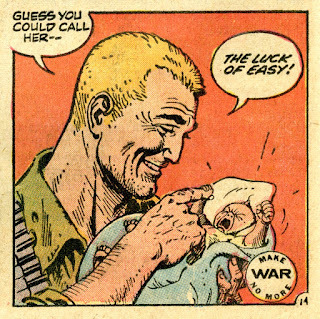 Rock declares the kid to be the "luck of Easy." But the kid shouldn't have been there at all. You don't bring your wife and unborn child into a war zone. That's simply NEVER a good idea. I do like this issue and I recommend it highly if you ever run across a copy. 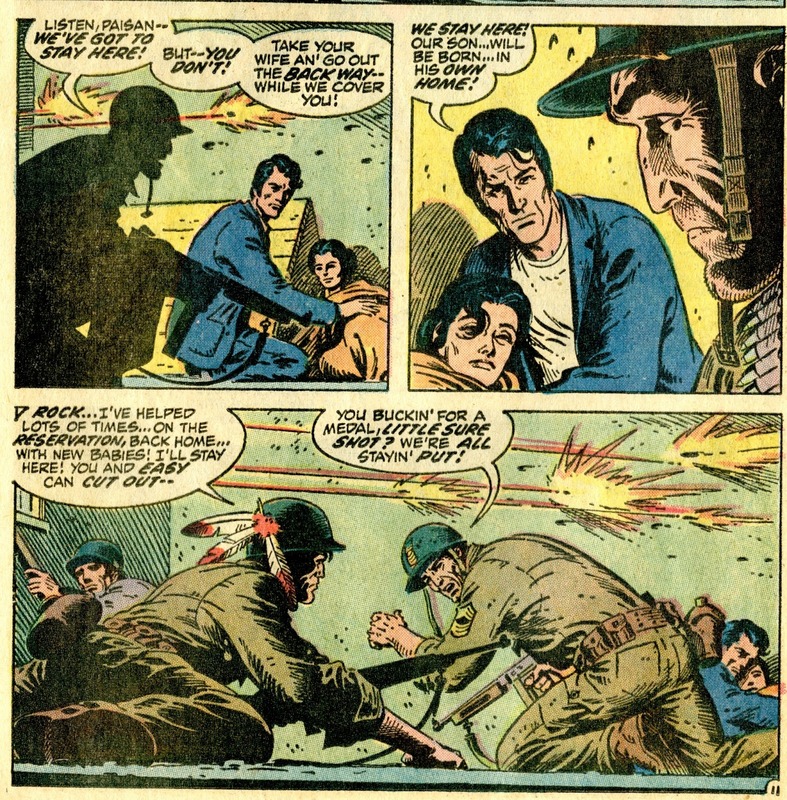 And, once again, I get that there's a theme of veteran soldiers still having empathy for the innocent. But I will always be a little unhappy with that farmer. Gee whiz. Below, I'm including the page-by-page video review of the back-up story in this issue--something a few friends and I made about a year ago. We talk a little about this story at the beginning of the video. 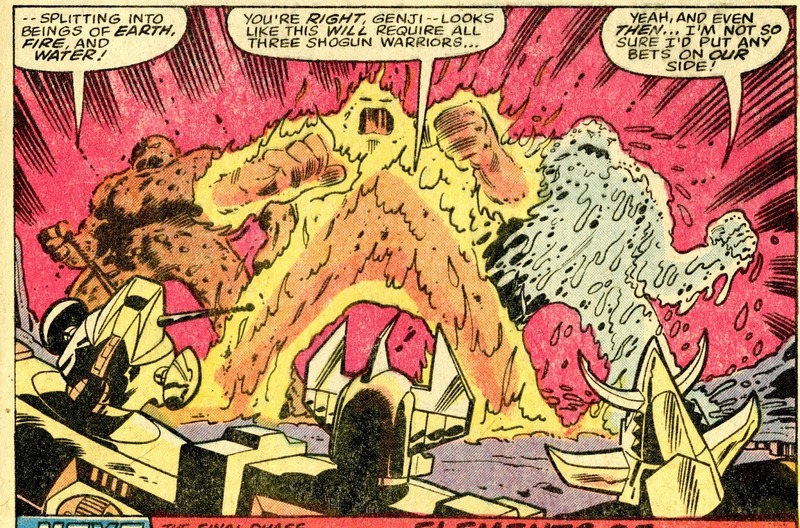 Next week, we'll begin a multi-part look at Marvel's Shogun Warriors. Over the next few months, I plan to do sporadic posts covering all 20 issues, probably in 5-issue chunks. If those particular reviews don't interest you--don't worry. I'll be interspersing them with other comic book reviews. 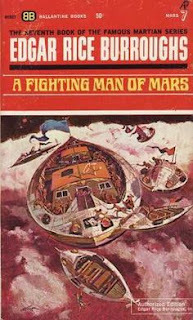 Exciting and kinetic Robert Abbott cover for one of ERB's Martian novels. The true story of the capture of a German U-boat during the Battle of the Atlantic. 1958's The Lone Ranger and the Lost City of Gold is the last time Clayton Moore and Jay Silverheels appeared as the Ranger and Tonto in a television episode or film. 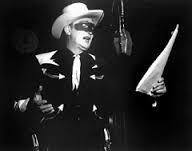 And they went out on a high note--the movie is one of my favorite Lone Ranger stories, with a strong story populated with interesting supporting characters. One of those characters is Frances Henderson (Noreen Nash), a widow who is also a prominent citizen in the local community. On top of that, she's a ruthless Femme Fatale willing to leave a trail of bodies behind her to get what she wants. What she wants are five medallions which, when put together, form a map giving the location of the titular Lost City. 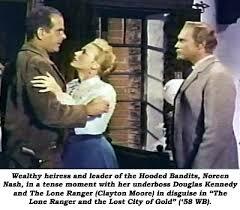 The medallions belong to five different Indians, so she vamps Ross Brady (Douglas Kennedy) into leading a gang of masked bandits to acquire them. The gang also pulls off a few other robberies to hide their real motive. 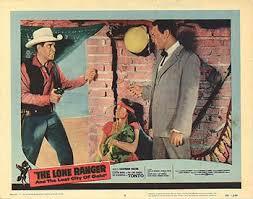 But it's hard to hide anything from the Lone Ranger. It's even hard for a cold-blooded Femme Fatale to vamp him, regardless of how pleasant she may be to gaze upon. As this clip shows, the Ranger will simply play mind games with her. Also, there's an Indian doctor pretending to be white to fit in with the town folk,an Indian girl who loves the doctor but is disgusted by what she sees as his moral cowardice in passing as white, and a brutal sheriff who hates anyone with red skin. 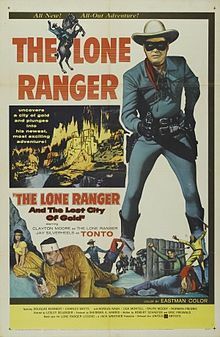 These subplots all tie nicely together for the finale, in which a wounded Tonto must protect the doctor, the girl and a baby while dodging the masked bandits in a deserted Indian village. Awesome before he finally collapses from his wound. But the Ranger is there to take over. Oh, and IMPORTANT SAFETY TIP: If the Ranger's horse Silver has befriended a baby, do NOT in any way at all threaten that baby. It won't end well for you. It just won't. Aside from a great story wrapped in clever mystery and highlighted by strong action scenes, the movie is also notable in how it portrays racism as the brutal and hurtful thing it is. For a movie from the 1950s that would have been marketed to children as well as adults, this it truly impressive. As of my writing this, I'm not sure if I'm going to consciously do a Part 3 to the Femme Fatales in Westerns theme. But these nasty if beautiful women show up in Westerns nearly as often as they do in Film Noirs, so we'll probably touch on the subject again in the future regardless of how I title the post. A Whaling We Will Go. 18th Century hunter/trapper Ben Bowie and his crew had six appearances in Dell's Four Color anthology book before getting 11 issues of his own series (with the numbering starting at #7). 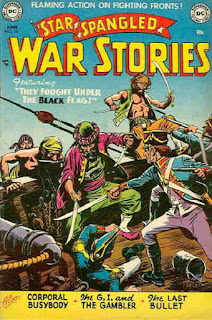 Stories that continued from one issue to the next were relatively rare in the 1950s, when comic book distribution was such that a young reader couldn't always depend on finding the next issue of a specific title on the spinner rack. But the unidentified writers and artists telling Ben's tales managed to sneak in a brief story arc. Though individual stories were still self-contained, Ben and his crew spent five issues traveling to the far West, exploring and setting up a trading post in what was for them is brand-new territory. 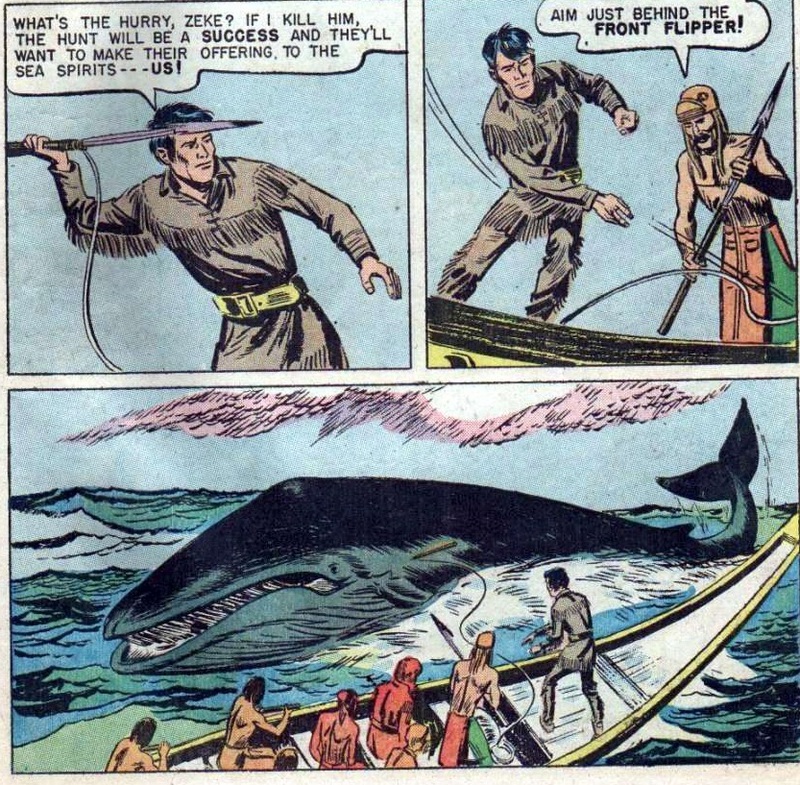 In Ben Bowie #8 (Aug-Oct. 1956), they make it to the Pacific Ocean, encountering a tribe of Chinook Indians. They manage to make friends and discover that salmon is mighty tasty. By the way, I did a little tiny bit of research into the Chinooks and the Nootkas--who appear later in the story. 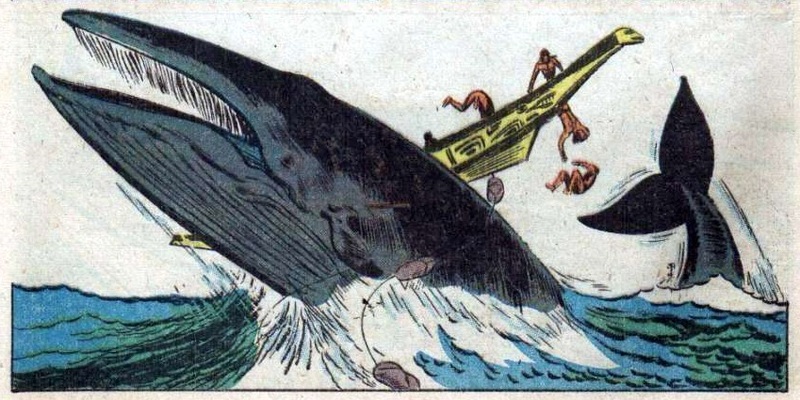 The portrayals of both tribes (Chinooks as fishermen & Nootkas as whalers) seem to be reasonably accurate. There may be many details wrong that an expert might notice (and keep in mind that my research was minimal), but it does seem that the creative staff behind Ben Bowie made a real effort towards historical accuracy. 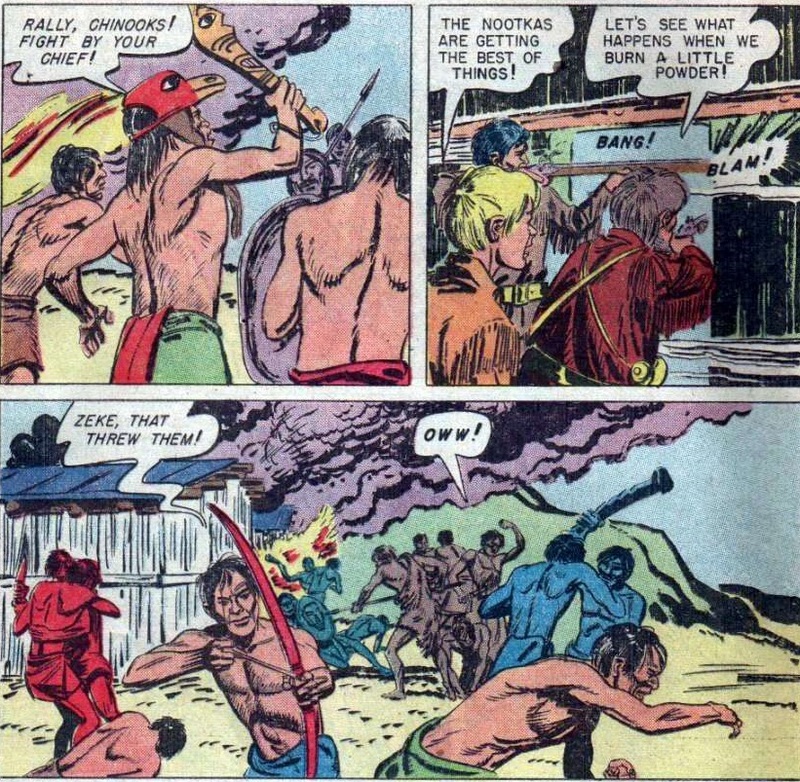 Back to the story: A Nootka raiding party attacks the Chinook village. 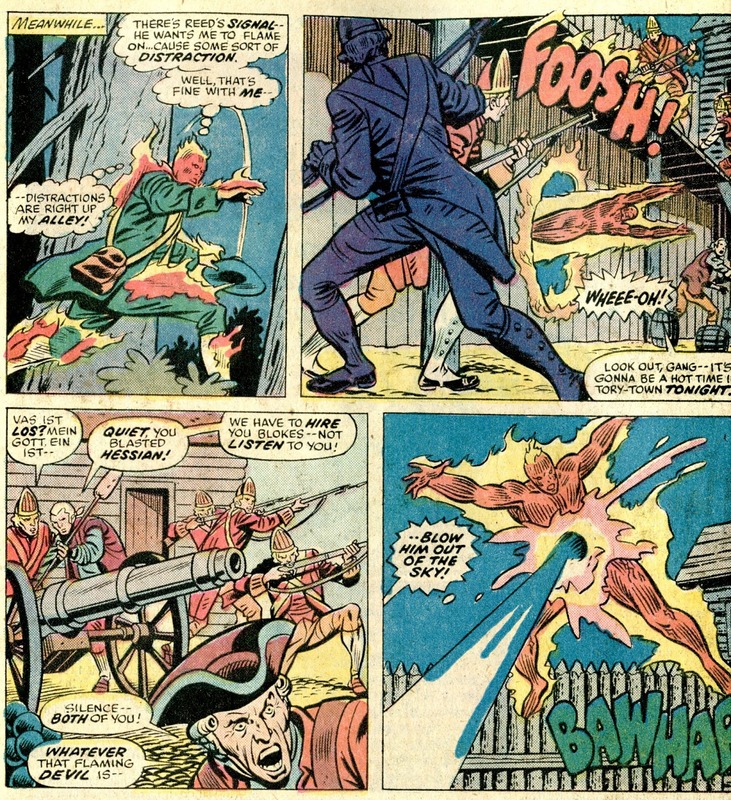 Ben and his crew help fight them off, but not before several prisoners are taken. The Mountain Men grab a canoe and follow, hoping to rescue their new friends. In a plot twist I really enjoy, their small canoe begins to swamp in the heavy seas, forcing them to call out to the Nootkas they've been chasing for help. The Nootkas haven't seen white men before, so for a few days after the Mountain Men are brought to their village, they are novelties--kept around as sort of combination guests/prisoners. 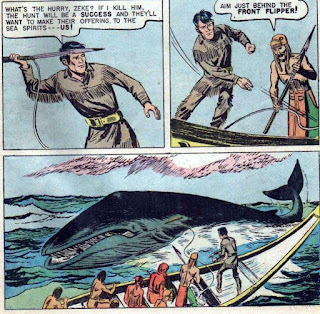 Then the local medicine man decides that if a whale is caught during the next hunt, then that's an omen meaning the Mountain Men are to be thrown into the ocean. With their hands tied. Well, omens can be both good and bad. When the Nootka hunt leader misses a harpoon cast, he decides Ben should get a try. I really like the art work in the next few pages--there's an effective use of long panels to highlight just how darn big the whale is. Despite a dunking, Ben puts a couple of harpoons into the whale and the hunting party as a whole finishes it off. 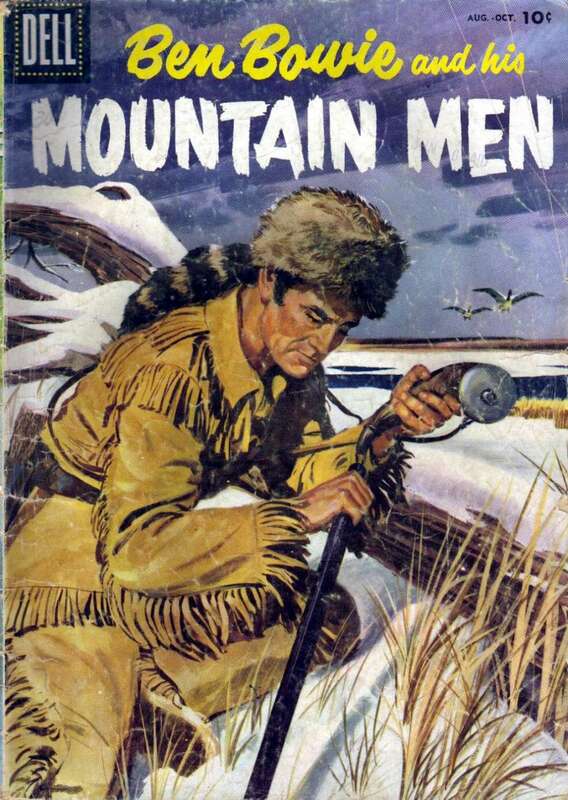 The Mountain Men are given their freedom and Ben even manages to talk the Nootka medicine man into freeing the Chinook prisoners. I really enjoy the Ben Bowie series and this story is an example of why. It's a well-constructed tale with an interesting setting and a great action set-piece built around the whale hunt. The art is effective and engaging--the artist is unidentified, but the style looks maddeningly familiar to me. I have a feeling it's an artist whose work I know. This issue is in the public domain and can be read online HERE. Next week, we'll see how Sgt. Rock combines fighting Germans with pre-natal care. 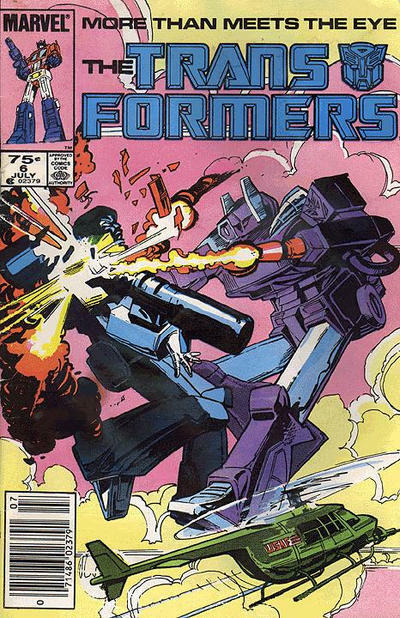 Despite great voice work by Corey Burton, Shockwave was under-used in the original Generation One Transformers cartoon. 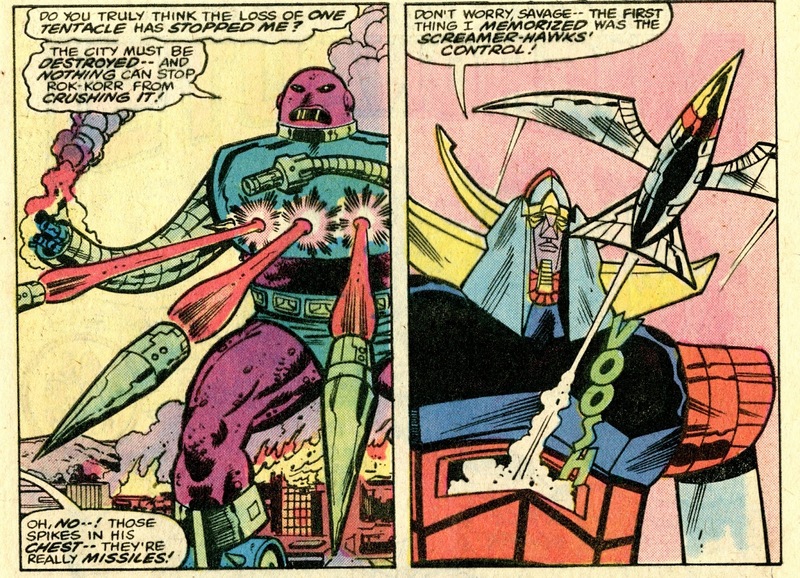 But he was an effective villain in the Marvel Comics series, often taking leadership of the Decepticons away from Megatron. Before conducting a bomb test, the military must evacuate primitive natives from the remote island chosen for the test. But the natives aren't necessarily that primitive. For that matter, they aren't necessarily "natives." 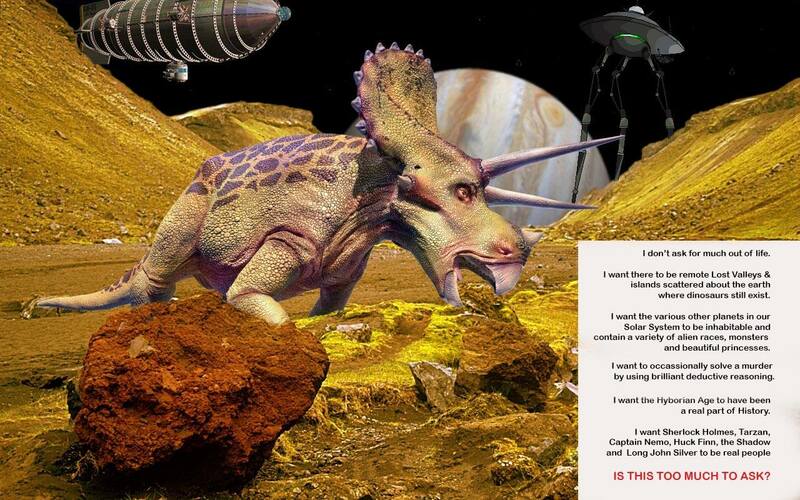 In my mind, Space Opera and Hard Science Fiction are two different (though equally valuable) genres. If I'm reading a Space Opera, then I'm perfectly okay with giving Mars a breathable atmosphere, sword fights freely mixed in with ray gun battles, and space craft that dog-fight in a vacuum as if they were in an atmosphere. I'll happily ride across the Martian desert with a Thark or take a trip on the Millenium Falcon with a Wookie. A good writer still has to give all this a sound internal logic, but none of it has to make real-life sense or agree with real-life science. 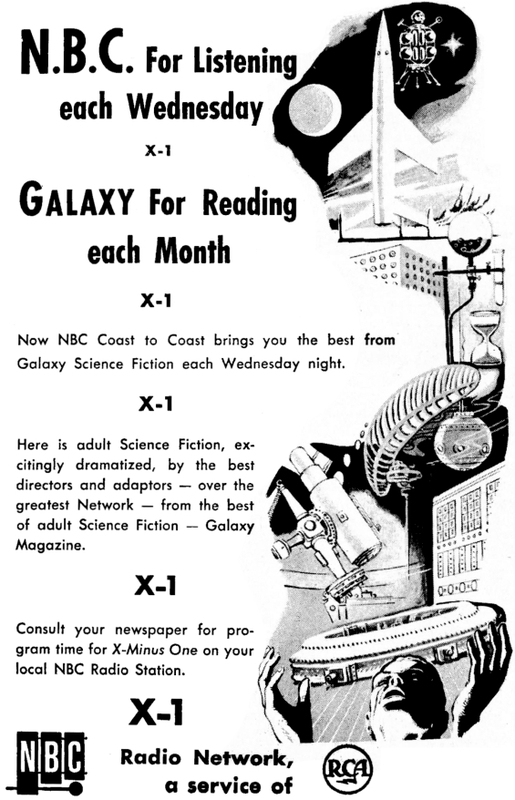 But if I'm reading a Hard SF story, then I expect more rationality and proper science. I'm not looking for Tharks and Wookies here. I'm looking for aliens who are truly alien--not just in their body shape and physiology, but also in their culture and thought processes. 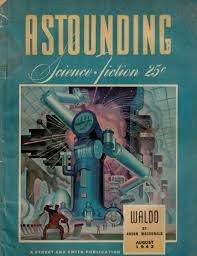 One of Hal Clement's early stories was "Impediment," published in the August 1942 issue of Astounding Science Fiction. It's not surprising that Clement found a home for his stories in Astounding. At the time, the magazine was edited by John Campbell, arguably the man most responsible for bringing scientific realism and maturity to the genre. "Impediment" tells of a crew of insect-like aliens who arrive on Earth in need of supplies. They've got plenty of food and fuel, but they've still need something important. These aliens are indeed Alien. They communicate through a sort-of telepathy, picking up electrical impulses from other brains via their antenna. So when they contact a human (a young college student named Allen Kirk), the first hurdle to overcome is realizing that humans actually make sounds to communicate with each other. Clement does a magnificent job of succinctly introducing us to the aliens, presenting the problems rationally, then allowing his characters to find rational solutions based on the situation. That's what Clement always did in his stories--Lester del Ray referred to him as a Rationalist. His stories would create a problem or problems, then force the protagonists into finding solutions that make sense. "Impediment" adds another layer to this by remembering that Allen Kirk and the aliens can never truly understand each other--their basic attitudes, ingrained thought processes and ideas of right and wrong are simply too different. When Kirk learns the aliens are essentially what he would consider pirates, he wonders with he can ethically help him even though he now feels real friendship for Talker (the alien with whom he learns to communicate). But Kirk's assumption that Talker feels (or is capable of feeling) the same friendship is erroneous. At the same time, assumptions that Talker is making about all humans--based on his interactions with Kirk--aren't necessarily sound either. I don't think I've every run across a Clement story or novel that I didn't enjoy enormously. Few other writers every made logic and problem-solving this much fun. Last week, I wrote about a Micronauts story that could be used as a working definition for the word "fun." 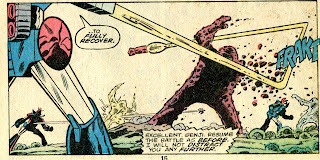 But Giant Size Fantastic Four #2 (August 1974) could give the Micronauts a run for this honor. 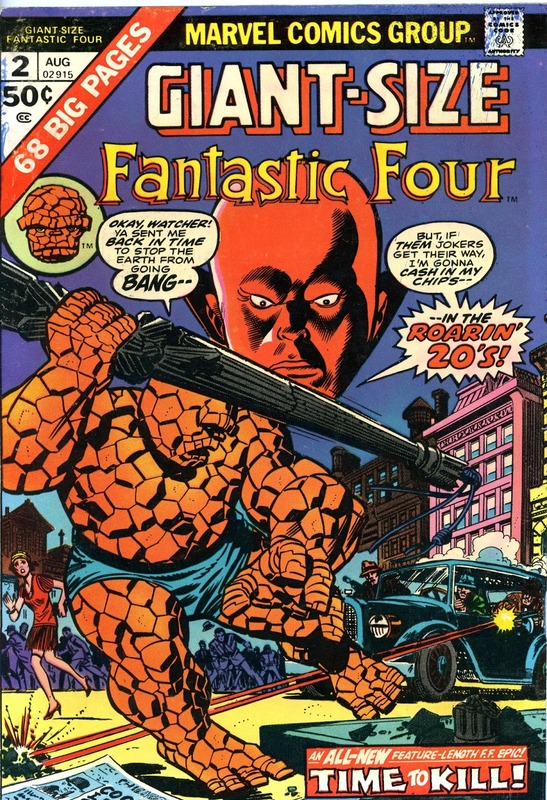 Written by Gerry Conway and featuring magnificent art by John Buscema, it tells a self-contained superhero story that follows a path of Comic Book Logic which starts in a Neanderthal-inhabited swamp, travels in time to the American Revolution, stops off in Prohibition-era Chicago and then takes us to a bizarre alien planet. And it all does indeed make sense. 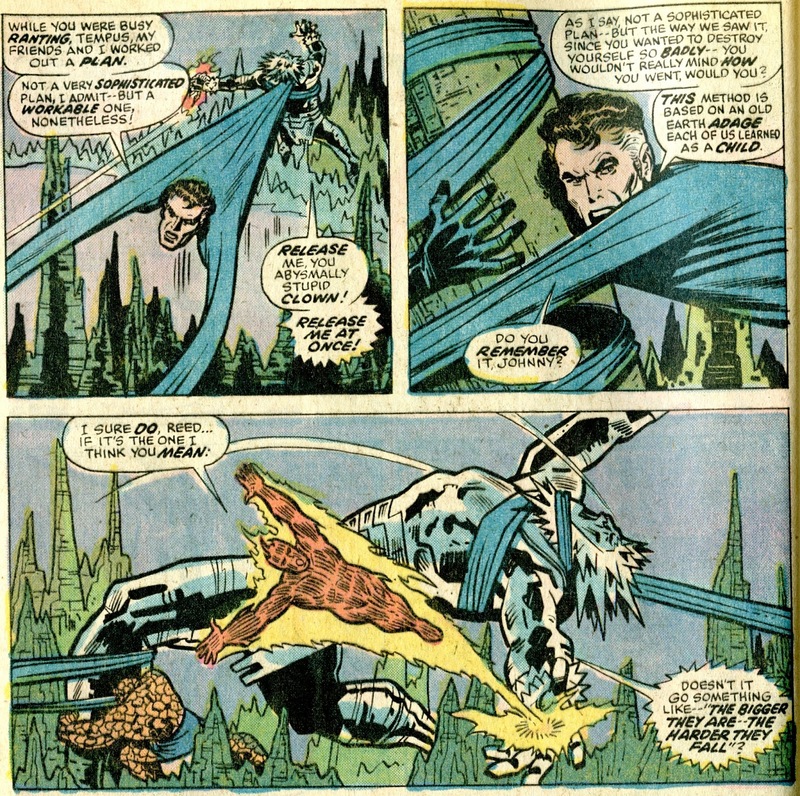 Also, we get to see Reed Richards and Johnny Storm mug a couple of guys, which I think is awesome in its own way. 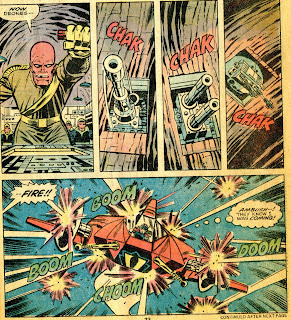 Someone sneaks into the Baxter Building and uses Dr. Doom's old time machine, causing reality to change. 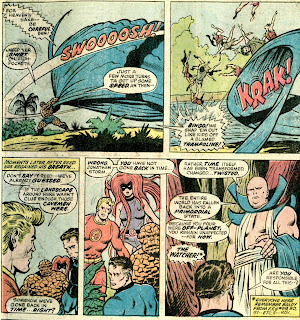 The Fantastic Four (at that time consisting of Reed, Johnny, Ben Grimm and Medusa) are test-flying a new space shuttle, so they are unaffected by the change. They end up crash-landing the shuttle in a swamp that now exists where Cape Canaveral should be. 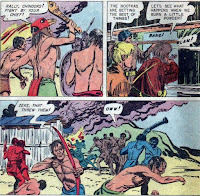 They are promptly attacked by cavemen. Well, this is something that even the FF finds unusual. 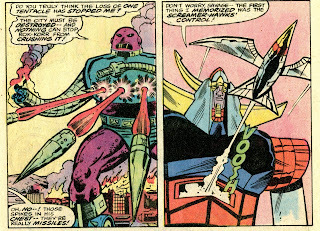 The Watcher, breaking his non-interference oath for the 532nd time, explains that an unknown person somehow access Doom's time machine and was mucking about in history, creating paradoxes which will eventually cause the Earth to cease existing. The team divides up to change history back to where it's supposed to be. The Watcher zaps Reed and Johnny back to 1777, where they promptly mug a couple of Rebel soldiers to get period-appropriate clothes. Heck, in the next chapter, Ben and Medusa are going to steal clothes from a store in 1928 Chicago. But I'm not judging--they are trying to save all reality and they are following a precedent set by Kirk & Spock in "The City on the Edge of Forever." appeared in front of him and spooked his horse. 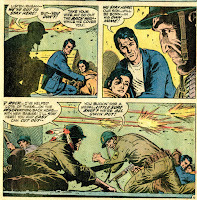 So the two time-displaced heroes stage a quick rescue and get history back on track. 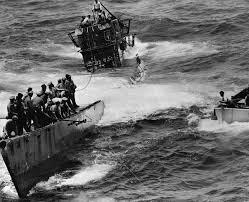 I suppose you can argue that the rescue is pretty easy--the British weren't equipped to deal with superpowers. 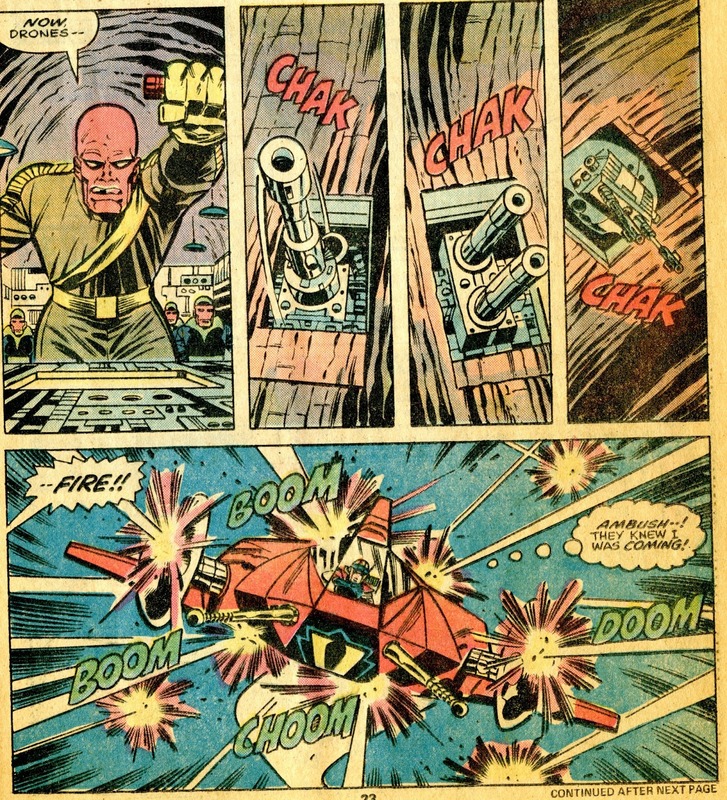 But Buscema makes it look too cool to allow any complaints. Ben and Medusa head for Prohibition-era Chicago. It's here that some minor criticism regarding the plot structure becomes legitimate. Ben reverts to human so that he and Medusa can dress appropriately and down the mystery time traveler. 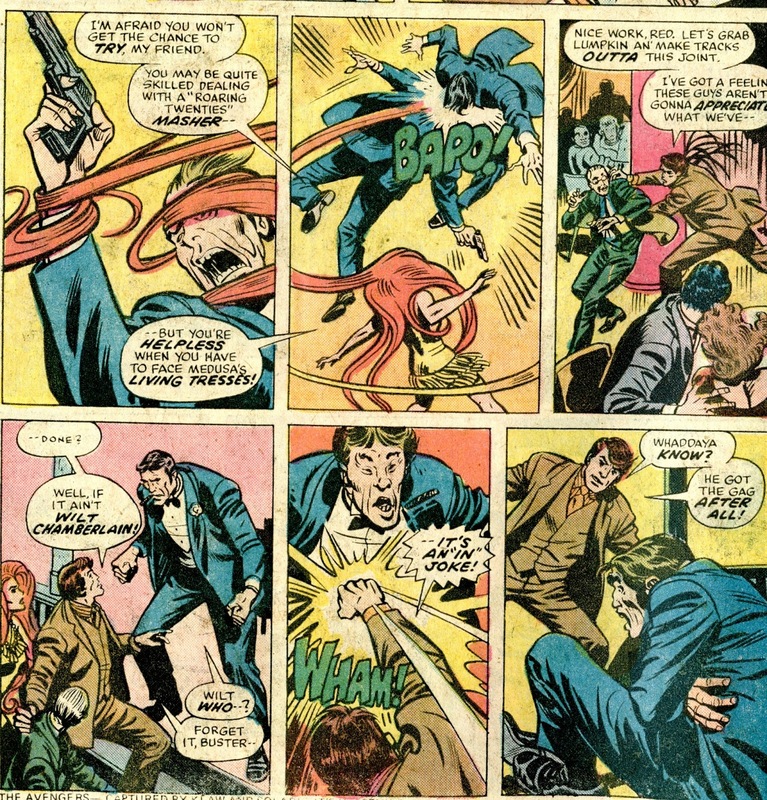 He assumes this has something to do with the Watcher's "time gizmo," but then he reverts back later without explanation when he has to take out a gangster with a tommy gun. It's reasonable to assume that the Watcher is doing this--giving Ben the ability to blend in when he needs it, then raw power when he needs that. But it's never really explained. Also, they find their target pretty much by just randomly deciding to visit a speakeasy. 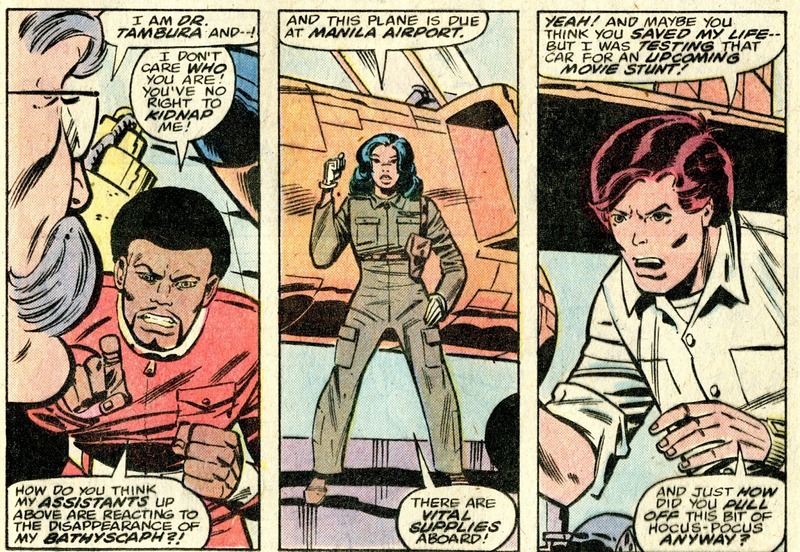 Ben chalks this up to Medusa's woman's intuition, but that's a tad bit weak. I get the impression that Gerry Conway had to squeeze in a few plot points a little too quickly to hit the right page count. But that is a minor criticism. In both art and characterization, this chapter is still a lot of fun. Medusa looks great in a flapper outfit, Ben gets to demonstrate that he can handle himself even when he's fully human, and 1920s cars & tommy guns are always a welcome sight. Ben's reaction when he changes back into the Thing is sincerely heartfelt. Oh, by the way, the mysterious time traveler turns out to be Willy Lumpkin, the Baxter Building's mailman. He was giving some local gangsters stock tips about the upcoming Crash, which would have once again mucked about with history. The final chapter has the FF and Willy all appearing on a Dali-esque planet ruled by Tempus, one of the many, many all-powerful immortals that hang around any self-respecting comic book universe. 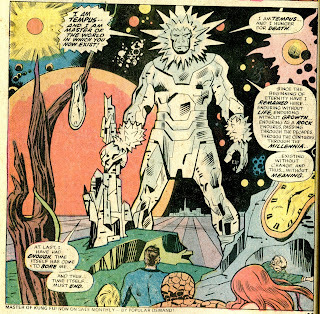 In this case, though, Tempus doesn't want to be immortal anymore ("Time itself has come to bore me"), so he compelled Willy to use the time machine, change history and destroy reality. It's the most complex method of committing suicide anyone has ever come up with, but if you're an all-powerful immortal, killing yourself probably is difficult. 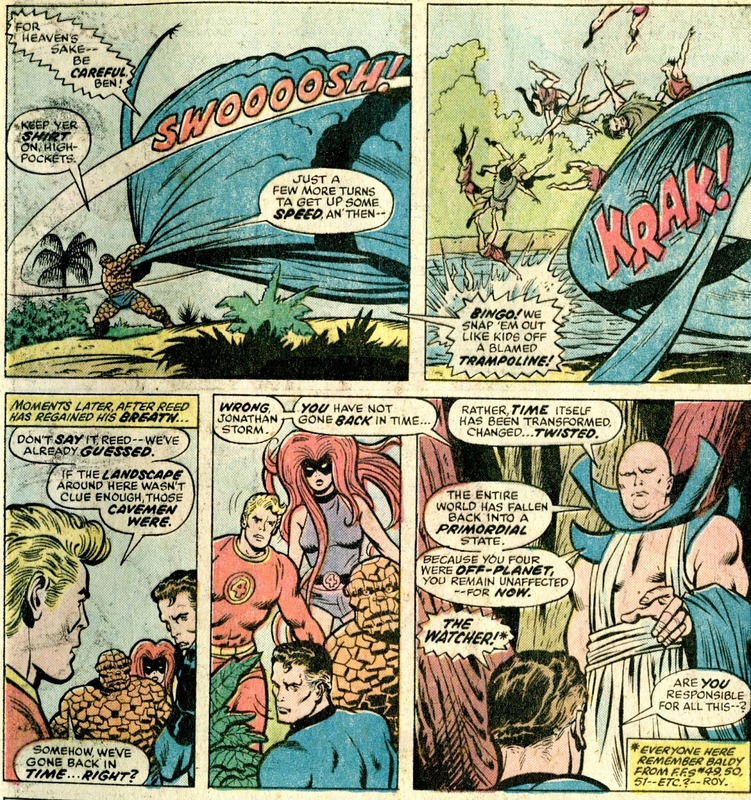 Tempus is upset with the FF for foiling his plan, but the FF manage to take him down fairly quickly. 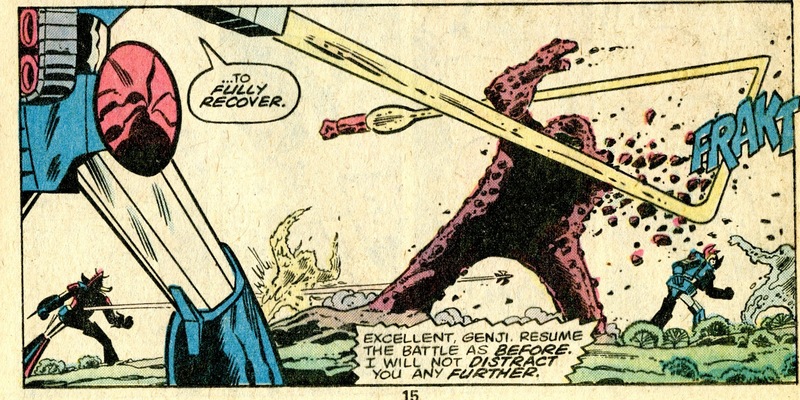 You may be all-powerful, Tempus, but Reed Richards can still outsmart you! 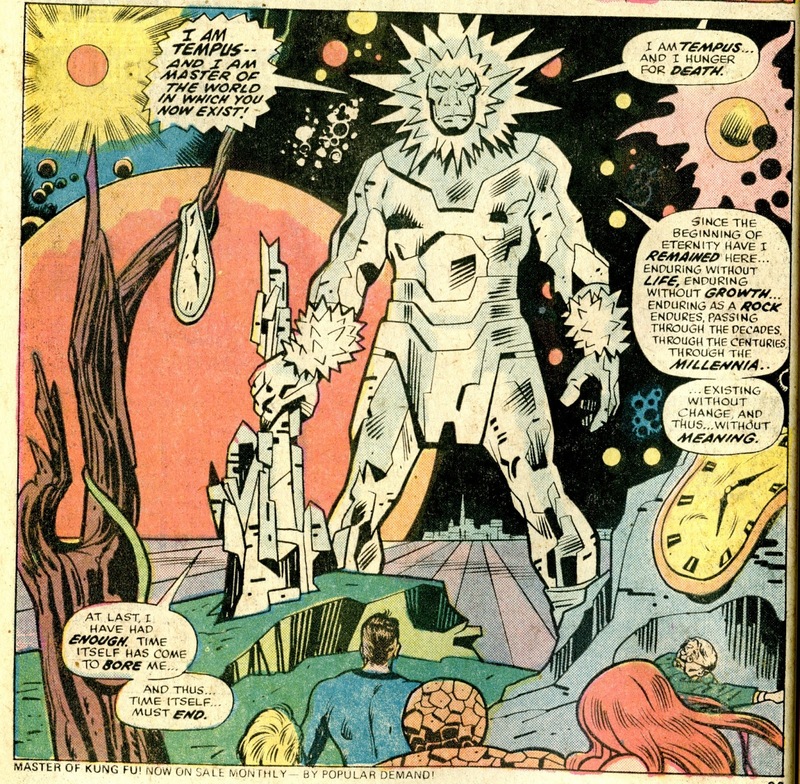 Buscema's art in this last chapter continues to look great, switching from relatively realistic settings to cosmic-level weirdness without missing a beat. I really miss stories like this. I slowly got away from reading modern superhero comics because I was rarely encountering this sort of fun anymore--stories that existed purely to entertain and inspire our sense of wonder. Stories that aren't padded to take up multiple issues when one issue will do. (Granting that in this case a few extra pages for improved plot exposition would have been nice.) I haven't read mainstream superhero comics regularly in some years now, so I won't presume pass judgement on them enmasse. But whenever I do try one, I don't encounter anything that touches on my sense of wonder. I'm not being reminded that in the end, superheroes exist to meld pure fun together with wild imagination. There's still room for deep characterizations and sophisticated plots, but these things should be a part of the wonder--not a substitute for it. Next week, we'll follow along with an 18th Century hunter and trapper as he paddles a canoe into the ocean to try his hand at whaling.